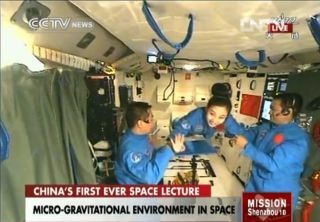 Life in space is fun, and the three Chinese astronauts currently in orbit have shared their first lesson on space living with students and countrymen on Earth. The Shenzhou 10 astronauts (or "taikonauts") beamed down China's first live space science lesson video to 330 elementary and middle-school children in Beijing from their position onboard the nation's Tiangong 1 space module. More than 60 million students and teachers also watched the televised broadcast from around China, according to the state-run news agency Xinhua. "In a weightless environment, we are very skillful marshal artists," Wang said after Nie floated around the lab in various positions. Wang showed the students how water behaves in space, creating a bubble of liquid to demonstrate the properties of surface tension while in microgravity. "Okay everybody, this is where magic happens," Wang said as she held up a bubble of water trapped within a metal ring. Wang engaged the students by asking questions throughout the nearly hourlong lecture. Students discussed how they weigh themselves on Earth before the taikonaut demonstrated how the space flyers weigh objects in microgravity. The astronauts also took questions from their student audience. "Do you enjoy any view that's different from what you can see on the Earth?" one student asked Wang. "Do the stars twinkle, and do you see the UFOs?" "From the window, we can see the beautiful Earth and the sun, the moon and the stars, but we haven't seen the UFO," Wang said. "As we are now in outer space without the atmosphere, we can see the stars shining brightly, but they do not twinkle." China's Shenzhou 10 crew launched into orbit on June 11 for a 15-day stint in space. Tiangong 1 is expected to remain in service for another three months, after which it will be deorbited or destroyed, experts have said. This trip marks China's fifth manned spaceflight. China's first astronaut, Yang Liwei, launched into orbit in 2003, making China the third nation to launch astronauts into space using its own vehicles after Russia and the United States. The Tiangong 1 space lab has been orbiting Earth since September 2011 and is considered China's first step on the way toward building a large space laboratory by about 2020.